Dr. Nobuyuki Kawai, an Associate Professor at the Graduate School of Information Science, Nagoya University, and his co-researchers have discovered that the marmoset, a small unretentive monkey with a relatively small brain, has high social intelligence. Their paper was published in Biology Letters on May 21, 2014. Human beings are sufficiently intelligent to understand complex matters, such as their relationship with others and among third parties. 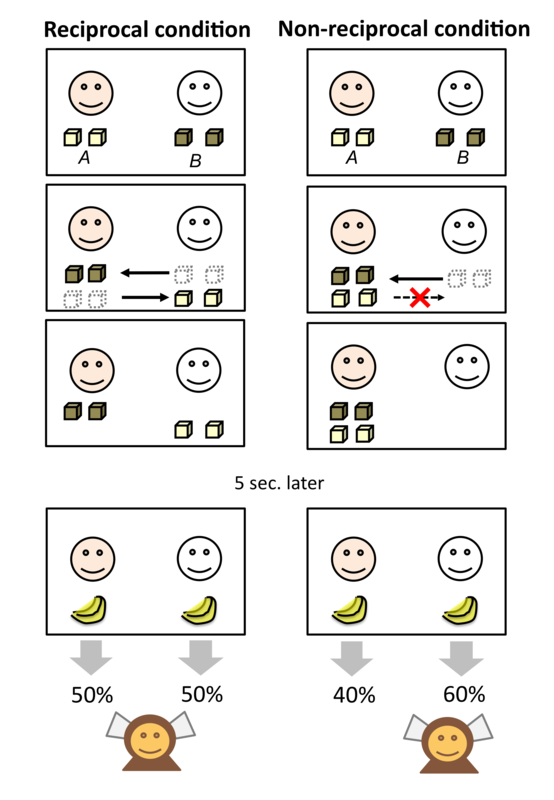 How this social intelligence was acquired in humans was not previously explained, although two hypotheses were proposed: It was attributed to humans' big brain or thought to be acquired gradually in evolution in society. Prof. Kawai's research group showed marmosets two performances acted out by humans: In one performance, two people exchange foods; in the other, one person passes food to other, but the other refuses to give any in return. The former performance exhibits reciprocity, and the latter non-reciprocity. Five seconds after the marmosets saw each performance, they were asked to choose either food offered by the performers. 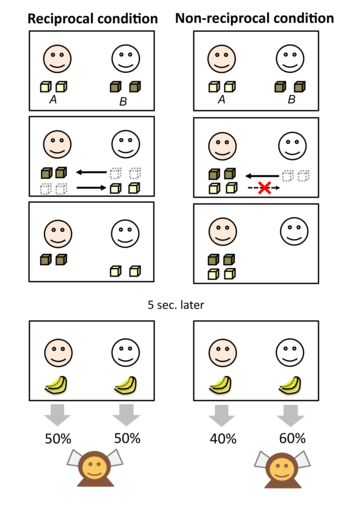 After seeing the reciprocal performance, they accepted food equally from both performers, whereas after the non-reciprocal performance, they received food less frequently from the performer who did not exchange food. It is presumable that they tried not to build collaborative relationships with those who did not reciprocate. Consequentially, his group discovered that marmosets can acutely understand communication and relations between third parties. The research showed that marmosets with a relatively small brain can possess high social intelligence, thus suggesting that the sociality of human beings has developed in evolution, in the history of human beings living in their complex society. The finding deepens our understanding of human beings, such as how our minds were formulated and how we acquired sensitivity toward social relations. In addition, it suggests marmosets as model animals for autistic spectrum disorder wherein they have social intelligence, can be genetically modified and easy to be bred. Therefore, it is expected that they will be used in many studies and accelerate neuroscience research. 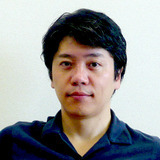 Associate Professor Nobuyuki Kawai researches cognition, learning, memory, attention, emotion, and evolution, using various animals such as chimpanzees, monkeys, horses, rats, fish, and crayfish. He became intrigued with life and the mind when he was a junior high school student, and took entrance exams for universities that have a department of psychology. He enjoys communicating with researchers from various areas of expertise and relativizes his research. He investigates what mental processes make us distinctly "human." Currently, he analyzes the operation of emotion by various examinations on the brain and body. He received the Young Scientist Award for Science and Technology from the Ministry of Education, Culture, Sports, Science and Technology, Japan, the JSPS Prize from Japan Society for the Promotion of Science, the Japan Academy Medal Prize from Japan Academy, and other many awards. "What is the real nature of human beings? Some people protect others at the cost of their lives, whereas some people kill others for trivial reasons. There are two different perspectives on the idea of human being: a belief that human nature is fundamentally good, and a belief that is fundamentally evil. I would like to deepen our understanding of human beings through empirical experiments and analyses of social events." "Have you ever thought about who you are? Psychology studies such questions; however, if you only think about yourself, you will never understand who you are. You can only understand yourself by comparing yourself with others. For example, if you are a child, comparing yourself with adults might give you some insights. If you are female, comparing yourself with males might change your view of yourself. My research asks challenging questions about what human beings are by comparing us with monkeys--members of the primate family that are closely related to humans. It is very intriguing to find my own answer to the question 'Who am I?'"